The Big Country stars Gregory Peck as ship captain Jim McKay, who moves out west to marry Patricia Terrill (Carroll Baker). 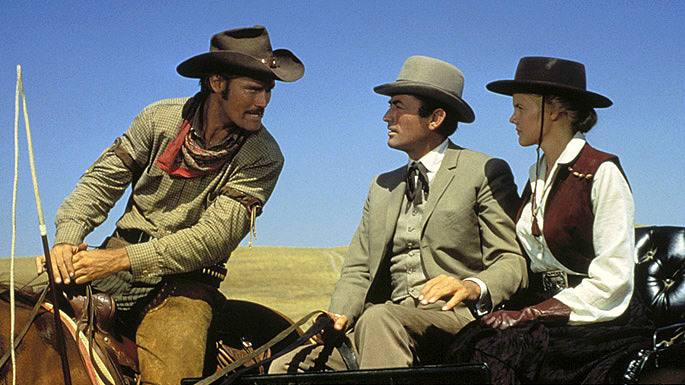 Arriving dressed in his eastern dandy best, Terrill ranch foreman Steve Leech (Charlton Heston) takes an immediate dislike for McKay, no doubt because of his own repressed attraction to Patricia. McKay is also hazed by the wild Buck (Chuck Connors), son of the boorish Rufus Hannassey (Burl Ives, in an Oscar-winning performance), a landowner competing with Patricia’s father, the Major (Charles Bickford), for the “Big Muddy,” a ranch situated between each of theirs and containing the only water supply for miles. This important piece of land is owned by a beautiful and pragmatic schoolteacher, Patricia’s friend, Julie Maragon (Jean Simmons). One early setpiece, a sort of anti-fight scene between two rival characters, is illustrative of Wyler’s approach to the story. McKay challenges rival Leech to a fight in the middle of the night. Leech has been riding the pacifistic McKay since he arrived in town, trying to assert his physical superiority in front of Patricia. McKay, though, is not the slouch Leech thinks he is. A true gentleman, he simply refuses to conform to Leech’s macho displays, preferring to handle such matters privately and peacefully. But at this point in the film, the rivalry with Leech has taken its toll: Patricia and McKay have called off the wedding because she is unable to understand McKay’s unwillingness to prove his manhood for her (or to her, for that matter). So Leech and McKay take the fight outside in an extreme wide-angle, day-for-night shot that looks like it was photographed from over 100 yards away. In other films, this would serve as an establishing shot used to set up the location’s geography so that the viewer may understand where the characters are positioned as the sequence gets more frenetic. Not in a film of this scope, though. As this shot demonstrates, there is nothing but prairie surrounding the two men for miles, save for Leech’s cabin. Their fight is a mere blip against the scale of the grand world they inhabit. In fact, though predictability would suggest the successive shots would slowly bring us closer to the two brawlers as the action rises, ending up with the camera between them, Wyler stubbornly resists this, rarely framing the two any closer than a full-length body shot, unless a crucial piece of dialogue is uttered by either of the men. It’s as if Wyler and Planer frame the shot in order to honor the noble McKay’s desire for privacy. It’s this tendency towards favoring mise-en-scène over montage that makes it essential that The Big Country be viewed in high resolution on a large screen. And for too long, the difficulties of restoring a Technirama print prevented such a thing from happening. But the new Blu-ray employs the 2007 Academy Film Archive/Film Foundation restoration (not so with the 2001 DVD). The Big Country also sports monaural DTS-HD Master Audio for the first time (showcasing Jerome Moross’ catchy, Oscar-nominated musical score), and adds a vintage featurette and television ad to the theatrical trailer included in the original DVD release. At nearly three hours, The Big Country takes its time with each scene, but with a deliberate purpose and payoff that can now be fully appreciated. Take my favorite scene, near the climax: The Major has brought loyal foreman Leech and his men to the narrow entry into Blanco Canyon, which separates his ranch from Hannassey’s. They’ve been lured there after Rufus kidnapped Julie. All of the men are aware it’s a trap, with the Hannasseys hiding behind the rocks that line the canyon, ready to shoot. But the Major is itching to settle his feud with Rufus, and is (over)confident that his men are up to the fight ahead. A chastened Leech has come around to believing McKay’s suggestion that the Major and Rufus’s feud will not end well for anybody. So Leech tries to talk the Major out of going into the canyon. But the Major calls him a coward, and after failing to enlist Leech’s men to follow, decides to go in alone. Quietly, Moross’ musical accompaniment starts as the Major marches into the canyon. A couple of shots later, in a beautiful setup that foregrounds the Major and places the entry into the canyon behind him near the horizon, we see a small solitary figure on horseback galloping toward the screen as the music begins to rise. It is Heston’s loyal Leech, deferentially sidling up to the Major as the music continues to rise. The same shot continues — this is all in one take — as another rider, and another, and then a whole group of them emerge from the same entryway into the canyon just as Leech did. They all slowly catch up to the Major and Leech as Moross’ rousing score hits its crescendo, the proud Major never once having turned back to look at his men. It’s an evocative sequence that captures the immensity of the setting and the characters that populate The Big Country. This review has been slightly modified since it was first published on 6/8/2011 in Nomad Editions: Wide Screen. The video above comes via frequent commenter le0pard13. Tony, you nailed the two best scenes in a great big movie. The closest I've ever come to a big-screen showing was when I saw it in a public library. It wasn't really that big, but still a lot bigger than the average home's TV set, and the effect of the canyon scene, helped along by Moross's music, was immense. A Big Country Blu-Ray is definitely good news. Excellent examination of this William Wyler classic, Tony. I'm sure you know that particular sequence is among my all-time favorites. So panoramic and yet so very personal. Great look at this, my friend. le0pard13, thanks for allowing me to post your video.